Western blot analysis of extracts from DLD-1 cells, transfected with 100 nM SignalSilence® Control siRNA (Unconjugated) #6568 (-), SignalSilence® MDR1/ABCB1 siRNA I #11879 (+), or SignalSilence® MDR1/ABCB1 siRNA II (+), using MDR1/ABCB1 Antibody #12273 (upper) or β-Actin (D6A8) Rabbit mAb #8457 (lower). 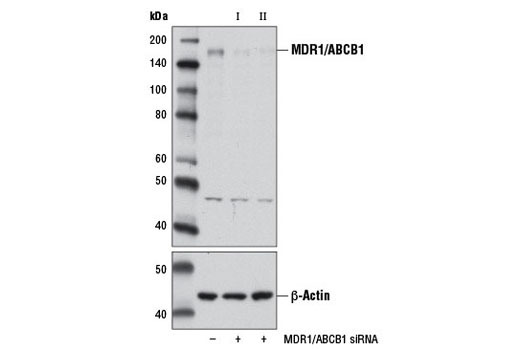 The MDR1/ABCB1 Antibody confirms silencing of MDR1/ABCB1 expression, while the β-Actin (D6A8) Rabbit mAb is used as a loading control. CST recommends transfection with 100 nM SignalSilence® MDR1/ABCB1 siRNA II 48 to 72 hours prior to cell lysis. For transfection procedure, follow protocol provided by the transfection reagent manufacturer. Please feel free to contact CST with any questions on use. SignalSilence® MDR1/ABCB1 siRNA II from Cell Signaling Technology (CST) allows the researcher to specifically inhibit MDR1/ABCB1 expression using RNA interference, a method whereby gene expression can be selectively silenced through the delivery of double stranded RNA molecules into the cell. All SignalSilence® siRNA products from CST are rigorously tested in-house and have been shown to reduce target protein expression by western analysis. MDR1/ABCB1 belongs to the Mdr/Tap subfamily of the ATP-binding cassette transporter superfamily (1). Multidrug resistance 1 (MDR1) serves as an efflux pump for xenobiotic compounds with broad substrate specificity. MDR1 substrates include therapeutic agents such as actinomycin D, etoposide, imatinib, and doxorubicin, as well as endogenous molecules including β-amyloids, steroid hormones, lipids, phospholipids, cholesterol, and cytokines (2). Research studies have shown that MDR1 reduces drug accumulation in cancer cells, allowing the development of drug resistance (3-5). On the other hand, MDR1 expressed in the plasma membrane of cells in the blood-brain, blood-cerebral spinal fluid, or blood-placenta barriers restricts the permeability of drugs into these organs from the apical or serosal side (6,7). MDR1 is also expressed in normal tissues with excretory function such as small intestine, liver, and kidney (7). Intracellular MDR1 has been detected in the ER, vesicles, and nuclear envelope, and has been associated with cell trafficking machinery (8). Other reported functions of MDR1 include viral resistance, cytokine trafficking (9,10), and lipid homeostasis in the peripheral and central nervous system (11-13). Furuya, K.N. et al. (1997) Cancer Res 57, 3708-16. Litman, T. et al. (1997) Biochim Biophys Acta 1361, 169-76. Chen, C.J. et al. (1986) Cell 47, 381-9. Kartner, N. et al. (1983) Cancer Res 43, 4413-9. Chen, G. et al. (1997) J Biol Chem 272, 5974-82. Brinkmann, U. and Eichelbaum, M. (2001) Pharmacogenomics J 1, 59-64. Fromm, M.F. (2004) Trends Pharmacol Sci 25, 423-9. Miller, D.S. et al. (2008) Pharmacol Rev 60, 196-209. Ambudkar, S.V. et al. (1999) Annu Rev Pharmacol Toxicol 39, 361-98. Raviv, Y. et al. (2000) FASEB J 14, 511-5. Meijer, O.C. et al. (2003) J Endocrinol 178, 13-8. Karssen, A.M. et al. (2002) J Endocrinol 175, 251-60. Jeannesson, E. et al. (2009) Clin Chim Acta 403, 198-202.